Stockbridge, MA, September 6, 2012— Norman Rockwell’s iconic Four Freedoms paintings will take center stage this week as an inspirational backdrop to a special naturalization ceremony on Saturday, September 8, in Stockbridge, when more than 20 residents will be sworn in as naturalized U.S. citizens in Norman Rockwell Museum’s galleries. This is just one of many public roles the famous oil paintings will play this year and in the future, as the Museum prepares to consider possible requests for loans and special exhibitions from afar. Part of the Museum’s permanent Rockwell collection, The Four Freedoms are perhaps the best known and most popular of all the artist’s work. To protect the original Four Freedoms paintings from UV exposure, dust, grime, and an adoring public, the Museum sent the four oil paintings to Williamstown Art Conservation Center last year to be glazed with Tru Vue Optium Museum Acrylic. The glazing project was supported by a grant from the Foundation of the American Institute for Conservation, which was generously matched by a private donor. Glazing with Tru Vue Optium Museum Acrylic not only protects the paint from abrasion, airborne pollutants, and dust, but also helps buffer the art from fluctuations in humidity. It also acts as a filter to minimize the effects of natural and artificial light. In the case of The Four Freedoms, the acrylic especially safeguards the works against oils from visitors’ hands on the paintings and from concentric impact fractures, as well as paint loss, crackling, fissures, and paint build-ups popping off. Unlike some acrylic products, Tru Vue Optium Museum Acrylic has an anti-reflective coating that reduces glare. It does not contain the occasional black specks associated with glass. And it is scratch-resistant. The Conservation Center in Williamstown removed the large paintings from their frames, cleaned them, and then glazed and re-framed them. After their return to the Museum, The Four Freedoms were re-installed in the special octagonal gallery designed just for them, where they have been enjoyed by hundreds of thousands of annual visitors. Painted by Norman Rockwell in 1942 during the height of World War II, The Four Freedoms were inspired by President Franklin D. Roosevelt’s 1941 State of Union Address in which he envisioned a post-war world based on freedom of speech, freedom of worship, freedom from want, and freedom from fear. By that time, Rockwell was highly recognized as a master of illustration. Rockwell created four everyday scenes from his Arlington, Vermont hometown to represent these basic freedoms. The powerful images were used on four consecutive covers of the Saturday Evening Post – the most popular magazine at that time with a circulation of more than 20 million. At the conclusion of the series, the Post sold 25,000 print sets to its readers. Shortly thereafter, The Four Freedoms became the centerpiece of America’s war-bond drive as the Office of War Information sent them on a 16-city tour called “The Four Freedoms War Bond Show.” More than a million people saw the paintings, and the tour raised $133 million for the war effort. Today, this would be equivalent to $9.55 trillion. The Office of War Information also distributed four million sets of posters to American schools and institutions throughout the world. After the War, The Four Freedoms paintings developed their own iconic identity which remains linked to our historic and cultural fabric today. 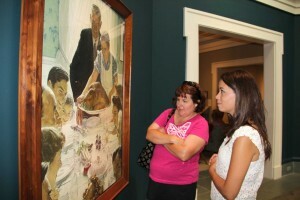 The Four Freedoms went on a second national tour between 1999 and 2001 – this time as part of Norman Rockwell Museum’s Pictures for the American People exhibition, where they were seen by nearly 1.4 million people. The Museum developed an extensive curriculum resource for teachers, based on the paintings. The Four Freedoms took center stage again in 2011 when the Museum presented “Four Freedoms Day” to commemorate the 70th anniversary of President Roosevelt’s historic address. Freedom of Speech is the cornerstone of the Museum’s Four Freedoms Forums, convened each winter and spring in the galleries to inspire civil public discourse about important current issues in the community and the nation.